A kind of toxic plant called cerbera manghas was recently found by a resident when he was taking a walk in Shenzhen Bay Park in Nanshan District, Shenzhen TV reported yesterday. Attracted by the white flowers and fruits on the tree, the man surnamed Bai looked it up on the Internet. The tree turned out to be a cerbera manghas, which is also known as sea mango because its egg-shaped fruit look similar to a mango. However, Bai wondered why a cerbera manghas had been planted along the park’s greenbelt, as its leaves and fruits contain toxins that are extremely poisonous. 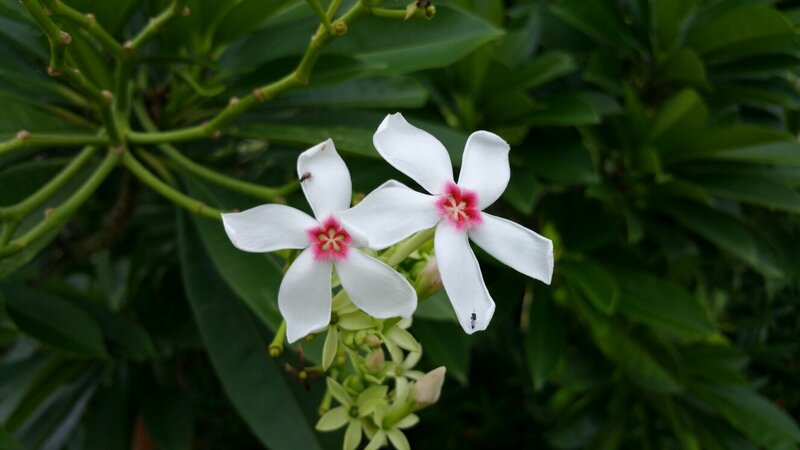 Cerbera manghas is a small evergreen tree with beautiful and fragrant flowers that occupies coastal habitats. It was grown in the park for decorative purposes, according to the management center of Shenzhen Bay Park. “It won’t hurt people as long as you avoid touching it. However, the sap of the tree may cause allergic reactions in children if they pick the flowers or fruit,” said Zhou Lanping, a senior engineer with the center. Zhou said the trees are unlikely to be removed from the park because they are both ornamental and can protect against tides, but the park will set up warning signs in prominent places. Liang Zhiyu, deputy director of the landscape department of the city’s urban administration, said there are thousands of different plants in the city’s parks, many of which are poisonous. Many plants in the Apocynaceae family have strong air purification functions, so they are very common along greenbelts across the city. Although they can’t be eaten, this doesn’t mean they can’t be touched, said Liang. Nevertheless, residents are advised not to pick and eat any wild plants while visiting parks. Plant experts also wanted to remind residents that most wild plants are not directly edible for humans and many secrete toxins, which is actually a plant’s way of protecting itself.